Hugh Farmer: Holts Wharf (藍煙囪貨倉碼頭) was a godown terminal in Tsim Sha Tsui. In 1905 a decision was made to purchase land in Kowloon for the construction of wharves and warehouses so that dedicated and independent facilities were available for the Blue Funnel fleet, part of Alfred Holt & Company. 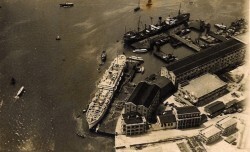 The wharf opened in 1910 and was jointly owned by John Swire & Sons and Blue Funnel Line. The Kowloon and Canton Railway (KCR) opened on 1st Oct 1910 and since the original TST station was next to the Wharf, the latter became a freight hub. Holt’s or Holts? Both seem to be used, I’m going with the latter .